Louisa M Hubbard 8 March 1836 – 5 November 1906. Louisa was a tireless and practical woman who put her back into creating opportunities for women. She did not do so for political reasons, and made a lot of effort not to appear political. She started out in the Anglican Deaconess movement, which could be thought of as an early precursor of the movement for female clergy though I doubt Louisa would have thought so) publishing a pamphlet Anglican Deaconesses; or Is There No Place for Women in the Parochial System? Disappointed at lack of progress in the Deaconess movement she set up a training college for women elementary teachers, set up periodicals A Handbook for Women’s Work, (later The Englishwoman’s Yearbook) and The Woman’s Gazette, (later Work and Leisure) and wrote articles to dispel the stigma of (middle class and genteel) women working, arguing that it did not make a woman less marriageable, and that single women needed to be able to support themselves, and should not be seen as failures for not getting married. At the time she got going, the only real option for single middle class women without means of their own, was to work as a governess or a companion. She encouraged women into all kinds of work that she thought suitable, nursing, midwifery, teaching, setting up friendly societies and guilds to help women support each other. She also recognised that work alone was insufficient, that for women to be independent they needed affordable safe housing, setting up the Ladies Dwelling Co.
Louisa also set up the Women’s Emigration Society. Women were actively discouraged from emigrating to British colonies, and Louisa felt that they were missing out on opportunities that men were encouraged to pursue. However the fact that emigration was promoted as a way to get a husband, leaves me ambivalent about this area of her work. 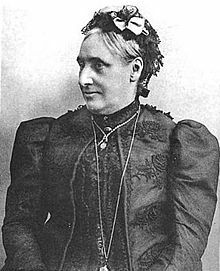 Louisa was clearly a very pragmatic person – see a problem, set about fixing it – she wasn’t one to snipe from a corner and complain that THEY ought to do something about it. By the end of her life much of the social stigma faced by middle class women who needed to work was gone, and she played a major role it making it possible for them to make a living. An invitation to the party would obviously be sent, but I suspect Louisa would be in the kitchen making sure everything ran smoothly rather than tucking into cucumber sandwiches and a small sherry. This entry was posted in feminist, history, The Historical Birthday-Tea Party and tagged emigration, History, Louisa M Hubbard, women and work, women's housing by Cherry Potts. Bookmark the permalink.